List intelligence: I looked at the lists that hashtag users are on and ranked lists by number of subscribers as well as number of hashtag users appearing on the lists. What does it mean? How can I use this? @alan What does it mean? Very little. I see it as a map of folk interested in the area, and e.g. who’s popular in terms of follower numbers. The lists: who knows; at the moment, lists aren’t used that much, but they do provide some sort of signal based around human curatorial effort; the list names may or may not be useful as tags to label the sort of area that ALTC2011 relates to. 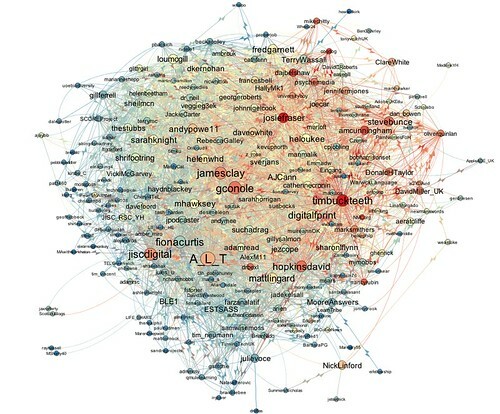 As to highlighting people who appear on lots of lists associated with people using the ALTC2011 hashtag, it’s possibly another signal that can be used to identify notable people in the community. On an educational level if you were using social networking in your class you could graphically see which students are influencing the network, who they are influencing, maybe spot some stragglers. I’d forgotten Alan was now whoring himself for klout (and presumably peerindex?) credit points. Whilst Klout persists in in rewarding follower numbers and random amplification, a good strategy would be to tweet things that attract spam bots; maybe avoid the pr0n stuff, but maybe go for stuff around careers/jobs/life-coaching (he can pretend these are relevant to education), maybe also start tweeting about Leicester to attract local followers (again, pretending that being followed by random Leicester-based estate agents is relevant to building up a strong local profile). Now are you sure you haven’t got something tucked away in the archives ;) That post is by one of the NodeXL leads Marc Smith. He started following me and retweeted a couple of my posts so I followed him back and had a look at his work … doh!